My sweet Grandmother Kelly (yes I am named after her!) had the BEST spicy dill pickles, and unfortunately no one in my family has her recipe. I have to say I am extremely sad. I absolutely loved her pickles. But I’m hoping one of you has one to share. 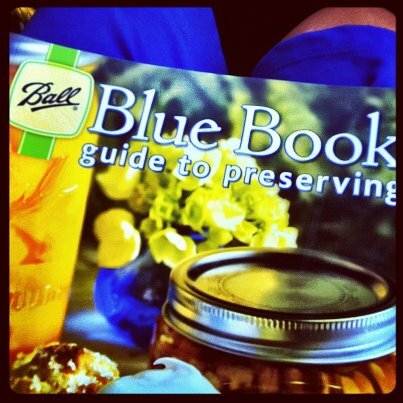 This was my weekend leisure reading, Ball Blue Book of Canning, and it was quite interesting. I grabbed my book at Walmart for about $7. But I have to say I am a bit intimidated. Hoping I don’t make my family sick with my little experiment. I asked my Facebook readers for their tips HERE. Have you ever canned before? Any tips, recipes or tricks I should know about? Please leave me a comment, oh and pray for me! I have been wanting to do this! Next year I’m planning on growing lots of tomatoes and then canning my own spaghetti sauce… yum. Anyway, but I personally am useless to you now as far as knowledge, but I know that my church has a cannery in Hendersonville. You could look up the info for the LDS cannery and I bet they could give you some good info. I cheat on my pickles and tomato sauces and just use Mrs. Wages seasoning packets. They definitely make the job a lot easier. I just canned some bread and butter pickles and I am getting ready to can some dill pickles later and will be using her seasoning packets. Just make sure that you have vinegar on hand. Tips for canning: Make sure that the water in the canner is not too hot compared to the jars and their contents, otherwise you will end up with broken jars. When you stuff the jars with veggies or fruit, really pack it in good and tight, otherwise you will end up with a jar of half juice and half produce instead of mostly produce. 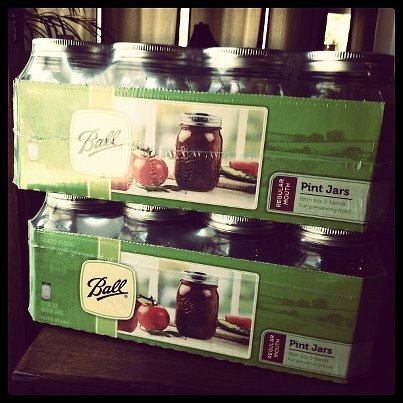 If you haven’t already, purchase the ball canning kit with the jar lifter in it and funnel and magnet lid lifter. I have found them very helpful. The Ball Blue book is a great resource. We’ve made several of the pickle and relish recipes and they have all turned out delicious. Ditto for canning tomatoes, salsa and jam. Do follow the recipes, because the acid level matter to safely can in a water bath. Head space stated for jar size is also important to ensure a vaccuum seal. The process to make sure everything is clean sounds overwhelming at first, but allow yourself plenty of time to go through the steps and you’ll develop a routine that works for you. If an occasional jar doesn’t seem to seal properly, just put it in the fridge and use that first. Have fun! I just got back from Louisiana helping my mom can figs. It was the first time I had done it. I would love to see some of the recipes you get or use. I would love to be able to can vegetables.